Most people have already heard about SPDY, the protocol, from google, proposed as a replacement for the aging HTTP protocol. Webservers are browsers are slowly implementing this protocol and support is growing. In a recent article I already wrote about how SPDY works and how you can enable SPDY support in Jetty. 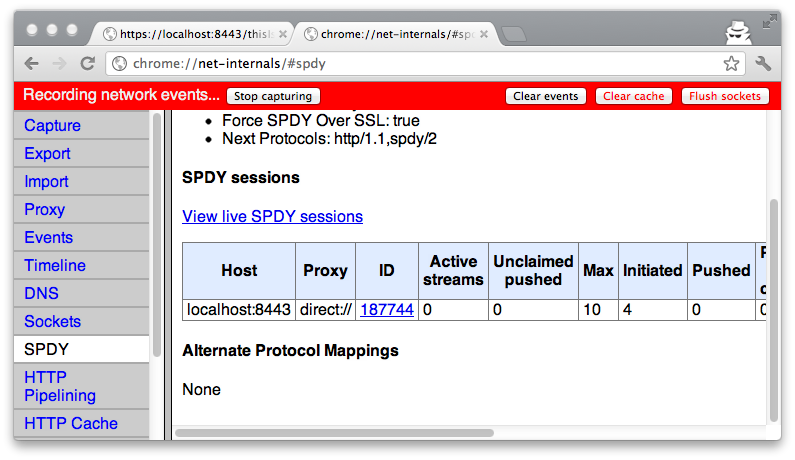 Since a couple of months Netty (originally from JBoss) also has support for SPDY. Since Netty is often used for high performant protocol servers, SPDY is a logical fit. In this article I’ll show you how you can create a basic Netty based server that does protocol negotiation between SPDY and HTTP. It used the example HTTPRequestHandler from the Netty snoop example to consume and produce some HTTP content. Enable NPN in Java to determine protocol to use. Determine, based on the negotiated protocol, whether to use HTTP or SPDY. Make sure the correct SPDY headers are sent back with HTTP. SPDY uses an TLS extension to determine the protocol to use in communication. This is called NPN. I wrote a more complete explanation and shown the messages involved in the article on how to use SPDY on Jetty, so for more info look at that article. Basically what this extension does is that during the TLS exchange a server and client also exchange the transport level protocols they support. In the case of SPDY a server could support both the SPDY protocol and the HTTP protocol. A client implementation can then determine which protocol to use. Since this isn’t something which is available in the standard Java implementation, we need to extend the Java TLS functionality with NPN. With this piece of code, Java SSL has support for NPN. We still, however, need access to the results from this negotiation. We need to know whether we’re using HTTP or SPDY, since that determines how we process the received data. For this Jetty provides an API. For this and for the required Netty libraries, we add the following dependencies, since I’m using maven, to the pom. This code is pretty much self-explanatory. The unsupported operation is called when the client doesn't support NPN. In that case we default to HTTP. The getSelectedProtocol is a method we will use to get the selected protocol from a different handler in the Netty pipeline. Now we need to configure Netty in such a way that it runs a specific pipeline for HTTPS request and a pipeline for SPDY requests. For this let’s look back at a small part of the pipelinefactory. There is no protocol: It's possible that no protocol has been negotiated yet. In that case we don't do anything special, and just process it normally. There is a http protocol: We set up a handler chain to handle HTTP requests. There is a spdy protocol: We set up a handler chain to handle SPDY requests. With this chain all the messages we receive eventually by the HttpRequestHandler are HTTP Requests. We can process this HTTP request normally, and return a HTTP response. The various pipeline configurations will handle all this correctly. The final step we need to do, is this test. We’ll test this with the latest version of Chrome to test whether SPDY is working, and we’ll use wget to test the normal http requests. I mentioned that the HttpRequestHandler, the last handler in the chain, does our HTTP processing. I’ve used the http://netty.io/docs/stable/xref/org/jboss/netty/example/http/snoop/HttpSnoopServerHandler.html as the HTTPRequestHandler since that one nicely returns information about the HTTP request, without me having to do anything. If you run this without alteration, you do run into an issue. To correlate the HTTP response to the correct SPDY session, we need to copy a header from the incoming request to the response: the “X-SPDY-Stream-ID” header. I’ve added the following to the HttpSnoopServerHandler to make sure these headers are copied (should really have done this in a seperate handler). Now all that is left is a server with a main to start everything, and we can test our SPDY implementation. And it works! Wget uses standard HTTPS, and we get a result, and chrome uses SPDY and presents the result from the same handler. In the net couple of days, I’ll also post on article on how you can enable SPDY for the Play Framework 2.0, since their webserver is also based on Netty.